Chocolats du CaliBressan celebrates its 3rd year in joining the 28th Carpinteria Avocado festival. 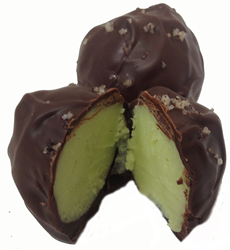 Chocolats du CaliBressan celebrates its 3rd year in joining the 28th Carpinteria Avocado festival by preparing their booth for their ever popular Avocado truffle, a white chocolate & avocado ganache dipped in dark chocolate and sprinkled with Tahitian sea salt. These truffles are requested throughout the year, but Jean Michel Carre, Chocolatier reserves them especially for the 1st weekend in October, appropriately for the avocado festival. The small beach town of Carpinteria comes alive with literally thousands of people searching out all things avocado. These delectable treats are also available in their 2 locations in Carpinteria and Santa Barbara for curious palates. Jean Michel Carre is no stranger in combining unique flavors that are known for their success. His 35 years as a Chef de cuisine, saucier, & patissier, all lead to a perfect balance in his enticing, unique flavors. For more information and a complete list of products, please visit http://www.chococalibressan.com.